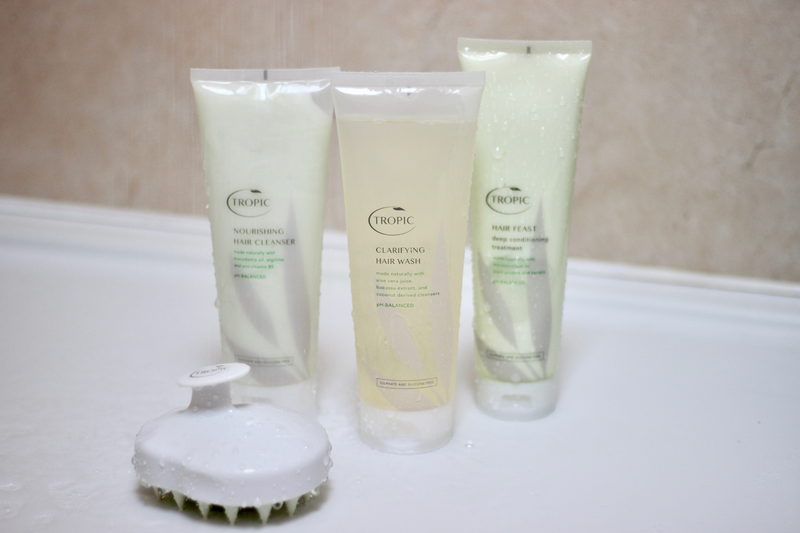 First up, we have the Clarifying Hair Wash and what I treat as a once-weekly deep clean, usually as part of my Sunday pamper routine, which rids product build up. 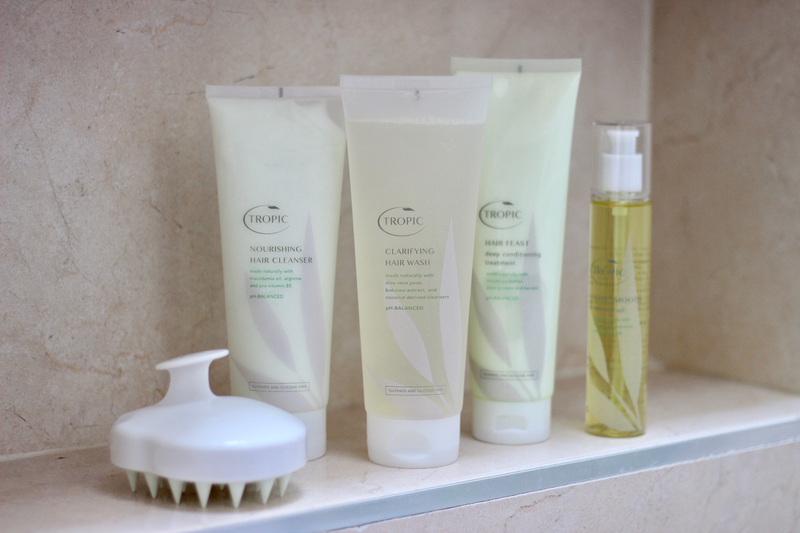 Using aloe juice, babassu extract and coconut derived cleansers, it's detoxifying enough for the scalp without stripping the skin or hair of its natural moisture and it just leaves your hair feeling well-washed. 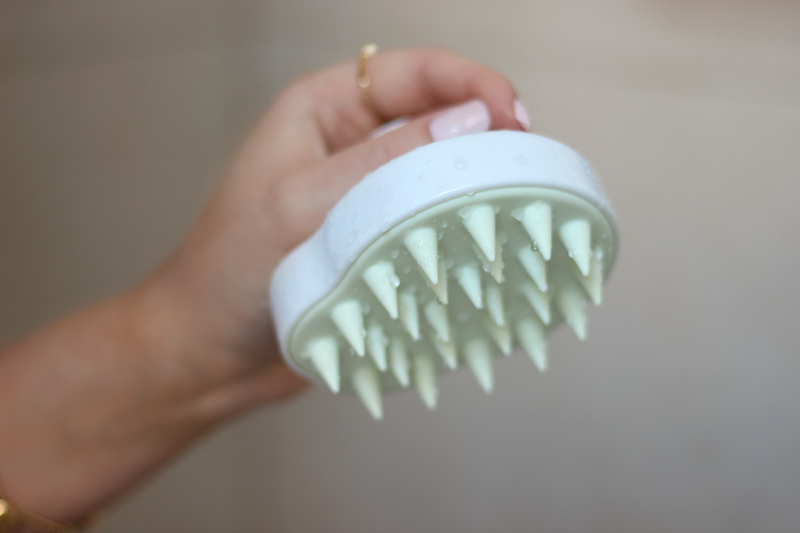 Worked in well with the Scalp Massager, it gets right into the roots whilst giving your head an all-over relaxing rub - it's a bit like that best part at the hairdressers, but in your own bathroom a.k.a it's GLORIOUS. Every other day, I reach for the Nourishing Hair Cleanser, a hydrating shampoo made natural with macadamia oil for reconstructing brittle strands, arginine which acts as a shield against damage if you colour your locks, and pro-vitamin B5 injects a whole load of nutrients promoting vitality and resulting in shine. After a good rinse, I then drench the mid-lengths to ends in Hair Feast, quite literally a deep-conditioning feast for your follicles with fatty-acid rich Murumu butter, plant proteins to strengthen and tamunu to hydrate. I tend to leave it in for a few minutes as a quick-fix condition or I'll apply it as mask, leaving it on for 10 or so minutes for more of intense dose of moisture which leaves my hair feeling it's very best. Post-shower, I run a pump of the Hair Smooth Radiance Oil through the very tips; it's light yet rich with Abyssinian and Maracuja oils and helps improve manageability thanks to the high concentrations of unsaturated omega fatty acids, then vitamin E works to repair and nicely nourish. A single drop is all that's needed to tame frizz and flyaways, seal split-ends and leave your hair feeling sleek, shiny and soft - I've seen a huge improvement in the condition of my hair for the better since slicking this through. 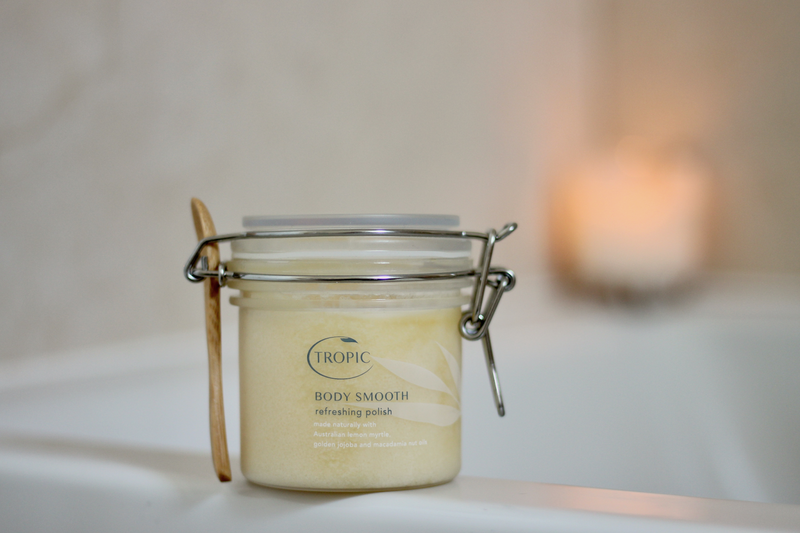 From hair to body comes their Body Smooth Refreshing Polish. Not only is this up there with one of the best things I've ever smelt - think lemon & lime flavoured Starburst, sweets but only 10 times more delicious... got it? 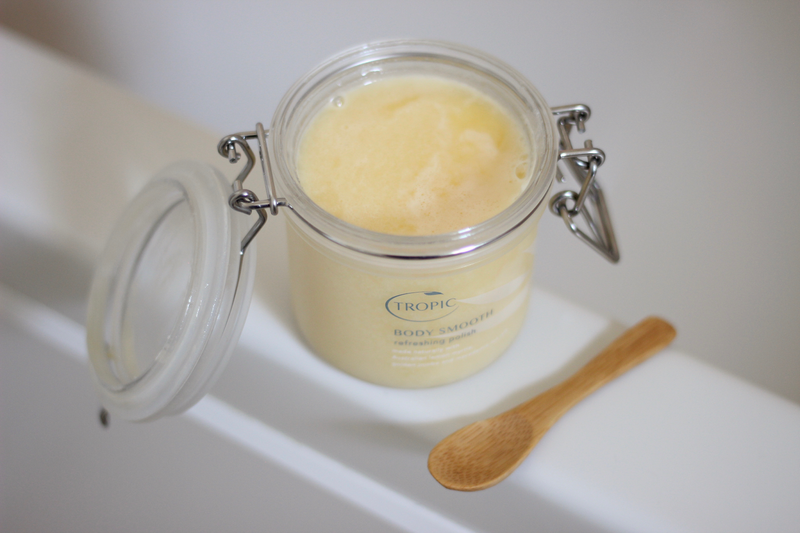 - it's the silkiest body scrub that just gets the job done. 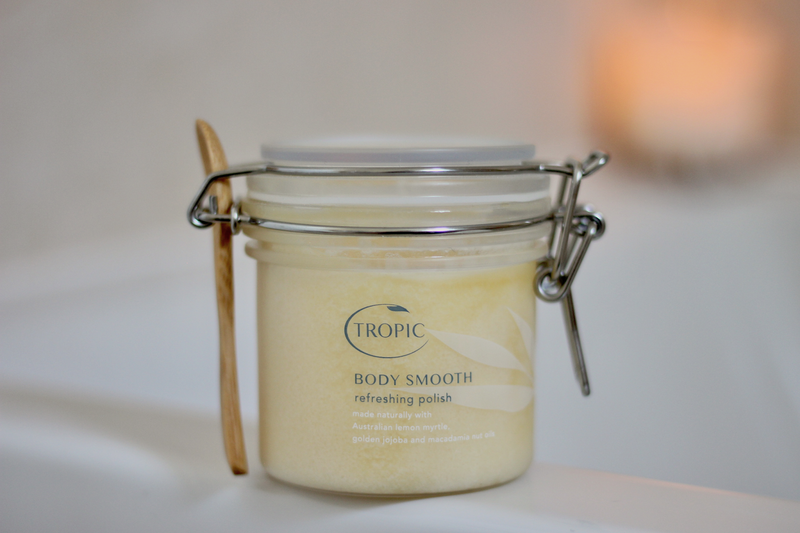 Made with lemon myrtle from Australia, golden jojoba and macadamia nut oils, it packs a whole lot of hydration whilst gently buffing to reveal the softest feeling limbs, which I've found also works wonders pre and post-fake tan; pre to ensure an smooth skin for the tint to adhere to and post to aid with even fading but also in that the citrus helps to remove any dodgy mishaps.